A great purple mystery looms high, a vast stone temple stretching into the starry sky. A foggy shroud clouds the mind of the wanderer as he stumbles through a strange landscape filled with ancient towering monuments, rotting tombs, fearsome beasts, and unholy necromancers. It is a place for lost spirits, where the unknown is not some abstract concept, but rather a permeating experience of the world. One meanders through, over, and under this setting of dreamlike beauty, simply soaking in the primal grace of each new vision. Of course this is one of the defining masterpieces of dungeon synth, mandatory for anyone claiming to have interest in the genre. It is very similar to "Keiser av en dimension ukjent" in style as well as tone. It has gone through two different artworks, the first being a purple landscape with several shots of Mortiis in his famous troll mask and attire. 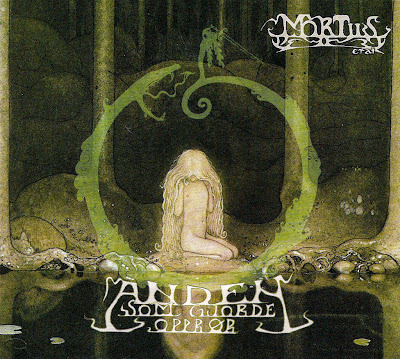 The second cover for this album, implemented first in 2007, is my personal favorite of John Bauer's artwork (whose fairy tale paintings were also used for "Keiser av en dimension ukjent" and "Crypt of the Wizard"). I'm not familiar with the tale associated with the illustration, however the contrast of darkness, magic, and a sort of bright mystical innocence is perfect for the music here. This is an album that one must get "caught in the flow" for. It's a cosmic stream upon which a young entity is drifting. Sometimes it is slow and majestic, with colorful, sparkling visions to behold on either bank, but at other times one hits the rapids, a grand medieval skirmish. It is an album perfect for daydreaming, which I personally consider to be the primary mood dungeon synth caters to. It is so magical because it gives the listener the power! It is not its own fantasy world, so much as providing a set for contemplation, where the listener can build their own fantasies (the exceptional art of it is connecting to the listener in a parallel way that allows such daydreaming). The music, of course, is simplistic. It uses the same vintage synthesizer found on all the Era 1 Mortiis albums. It seems, and one can read from interviews with Mortiis himself, that he did not know how to "properly" play the keyboard, but if ever there was evidence that grand artistic visions could be created through raw inspiration, it can be seen here. Many might be capable of performing this work, and its formula is a relatively easy one to follow, but very few dungeon synth records reach such majestic heights. Though it is quite similar to "Keiser av en dimensjon ukjent," the primary difference is that it is more adventurous and not so introspective. Mortiis just explores the mystifying inner fantasy land he has created, and is not questioning "why?" or reflecting so much. This work is much more about being in awe of this realm, content to wander about it, taking in all of its atmosphere and wonder. It seems more fresh, green, youthful, and colorful than the two works preceding this, as if a grand magical kingdom started to bloom, a spring to the winter that was "Født til å herske" and "The Song of a Long Forgotten Ghost." In this Mortiis is possibly taking a stance on dreams and fantasy. One is "spit out" into a world of biology and instincts, pressured to fit within a certain framework of his fellow mammals, and yet, that "tyrant" might feel another calling... And so the dungeon synth dreamer takes up his skull-topped staff and wanders into the unknown world within, isolated and lonely, but able to experience the magic of lost ignorance. Nature will contradict those instincts, the logic of which goes "mimic your brethren, reproduce," and yet he heeds the call of the unearthly realm, behaves quite contrarily to all his instinctual urges and the examples around him, and so the archetypes of nature curse him in their own way, its robotic children shunning that "master of the time-walls." It is possible that these instincts would've been "natural" in a pre-civilized world, the dreamer becoming a shaman of the tribe through a symbolic death of the individual, and yet in the chaotic torment of modernity we are now experiencing, dreamers seem to fall through the cracks. With nobody to seek their message, and no avenue through which to satiate the urges of the longing spirit, the dreamer must choose to either relent and give in to the tsunami of progressing civilization, or fight back and feel the full force of the "hate of nature," the repugnance and misunderstanding of the surface-dwelling men. But this album is far from simply a philosophical confrontation against modernity. In fact, it is an outright avoidance of that confrontation, recognizing the impossibility of victory, not even knowing the specific entity with which to wage battle. It is merely the call for the escape, beckoning one toward the mystical visions within, the only place where true meaning can be found. But this is not right either, it's not simply the call for escape, but also the gateway into the dreams of that grand decadent kingdom, one in which the listener is God, tyrant, and pilgrim. It might destroy the earthly man who wanders that weird, forlorn trail of dungeon synth, but on that journey he will experience sights of profound obscurity, seen by few other mortals. Great music you`ve done a good job with this blog.